I've been very busy using my brain at my new job while trying to maintain just the right amount of socializing. People ask me when I sleep. I'll sleep when I'm dead! In the mean time, I've got a lot of livin' to do and you know I've managed to find time for some fabulous adventures over the last seven or eight weeks. On March 8th, I went to Birdland to see the sparkling Kate Baldwin perform. Her shows are so very fabulous and satisfying. I just love her! On March 15th and 16th, I went to the birthday concerts for Stephen Sondheim at the New York Philharmonic. One night I sat next to Karigee and the other, Noah Himmelstein - both the most influential Sondheim lovers in my life. What joy! What excitement! What triumph! This concert is scheduled to be televised on Great Performances later this year for you people who were too unfortunate to be there to see the magic in person. Later that week, Noah and I caught the first preview of Sondheim on Sondheim at Studio 54. If you don't know why Sondheim is a genius after you see this show, you'll never know. And when you hear Barbara Cook's rendition of Take Me to the World and Send in the Clowns you might as well be at a master class. It's a funky show mostly for Sondheim lovers. I want to see it again. On March 22nd, I saw a concert version of Ricky Ian Gordon's opera Grapes of Wrath at Carnegie Hall. Wow! I loved it! Victoria Clark was Ma Joad, Nathan Gunn was Tom Joad, Elizabeth Futral was Rsasharn, Matthew Worth was Connie. Matthew Worth was fabulous. Christine Ebersole sang the small role of waitress Mae, and practically stole the show. The evening was narrated by Jane Fonda. I found it completely soul stirring and my eyes did not stay dry. By the way, Noah Himmelstein was the assistant director. Oh, I saw Dmitri Hvorostovsky and Sondra Radnovsky at Carnegie Hall on April 1st. We were in the next to last row of the house. Sondra has a voice that rattles the ceiling. They did the final scene from Eugene Onegin together. They are rock stars. Over March and April, I saw God of Carnage three times. The acting is ridiculously good. The story is frantic and pathetic but oh my goodness it's damn funny. The context is so serious but as the characters fall apart and dig themselves into a deeper hole, the funnier it gets. Dylan Baker, Janet McTeer, Jeff Daniels and Lucy Liu are giving it everything they've got. I did see Porgy and Bess at the Washington National Opera at the Kennedy Center on April 3rd. Who would think that the xylophone would be so thrilling? Plus, I really love going to the Kennedy Center. On March 27th, Karigee and I took the Metro North up the Hudson River Line to Beacon, New York. We went to Dia and saw art. It used to be a Nabisco factory and the space is now flooded with natural light. I loved the giant installation of Warhol's Shadows - I always thought he only did pop art. On April 17th, I saw La Cage Aux Folles the night before it opened with Chelsea and some other youngin's from Washington, DC, thanks to their early morning student rush efforts . It's romantic, touching, funny, and thrilling. Kelsey Grammer and Douglas Hodge played it beautifully. Here's a SarahB Endorsement: I was moved to tears during Song on the Sand . I want to see it again. I ran into Doug and Steve on Broadway at the stage door after. Go figure! Later that night, at Angus McIndoe's, Steve on Broadway introduced me to the West End Whingers. We closed down Angus' for the first time in a very long time - actually since the last time I was with Steve on Broadway at Angus' - I think it was after the penultimate Gypsy when Patti LuPwned that photographer. Coincidentally, CHELSEAwithaSEA was there both nights. On Thursday night, my friend Beth from Austin, Sally and I went to see Armida at the Met. I met my new email friend Glenda and her husband Steve who came all the way from Brisbane, Australia to fulfill her dream of seeing Renée Fleming at the Metropolitan Opera. We all went backstage after to visit La Diva in the green room. It sure was exciting watching Glenda meet her. I rather enjoyed Armida more than I thought I would - except that it's long due to really boring recitative, which Renée told me is rather difficult to sing because it sits low in her range. She also told me that she'll be singing a recital deep in the heart of somewhere that's near and dear to me later this year. On Friday night, after the third round of God of Carnage this time with Beth , Karigee joined us at Angus were we ran into Theatre Aficianado Kevin Daly, Steve on Broadway, and the West End Whingers. We were also introduced to Baz Bamigboye of the Daily Mail who kindly treated us to a Blue Moon. Once again, we were thrown out of Angus in the wee hours. What a trend. Yesterday, I became a member of the Whitney Museum of American Art. They have one Rothko on exhibit right now. It's true that I have a thing about Gertrude Vanderbilt Whitney, one of the great women of the 20th century. Speaking of Rothko, I saw RED on March 28th. It's the new play by John Logan about artist Mark Rothko, transferred from the Donmar Warehouse in London to Broadway. It is by far the best new play of the season and the performances by Alfred Molina and Eddie Redmayne are phenomenal. I want to see it again. Thinking of Alfred Molina reminds me that Donna Murphy played his wife, Mrs. Octavius, in Spider-Man 2 in 2004. I took Cody to see it and we both spent time covering our eyes. But, DONNA MURPHY! She can do anything and everything! I saw her three times as Mayoress Cora Hoover Hooper in ANYONE CAN WHISTLE at Encores! She is BRILLIANT! Indeed, Sutton Foster and Raul Esparza as well as the entire cast were BRILLIANT! Murder She Wrote: Season 12 , the final season, is now available for pre-order on Amazon for $34.99. It sort of makes me sad that there will be no more seasons to look forward to, unless Universal decides to release all of the Murder, She Wrote movies on dvd. Please. Remember I was a fan of Angela Lansbury as Jessica Fletcher in Murder, She Wrote LONG before I knew that she was Queen of Broadway. 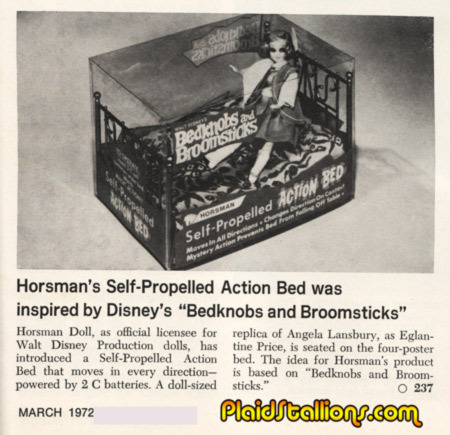 Yes, I did finally find the Bedknobs & Broomsticks Eglantine doll sans self-propelled action bed via Ebay for $11.00. I haven't had this much fun playing with a doll in a very long time. However, I still want the bed and shall not give up. 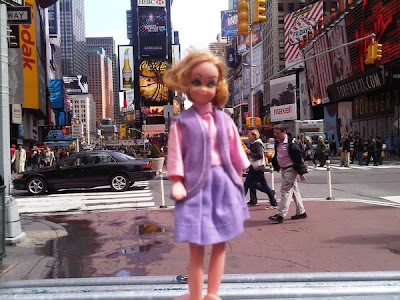 I just can't get over that Eglantine doll!